The overrun clutch mechanism is a type of ratchet commonly used to drive the rear wheel of a bicycle, in such a way that pedaling moves the bike forward but with the bike coasting the pedals are not forced to turn. As the clutch driver delivers torque to the driven device, the rollers or balls are wedged into the tapered region. When the driven member attempts to drive the driver in the directions shown, the rollers or balls become free and no torque is transmitted. If you need custom mechanical parts machined – eMachineShop can help. 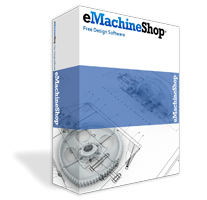 Simply download our free CAD software, design your part, get an instant price and click to order!